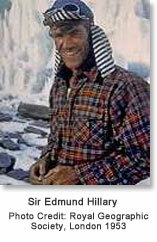 Over the course of his life, Sir Edmund Hillary published 10 books and countless articles. This month, we chose to read Hillary’s first and last books as a part of the Berg Adventures Travel Reading Series. His first book, High Adventure (1955) tells the exciting story of the successful Everest Expedition of 1953, and his last book, an autobiography called View from the Summit (2000) covers everything from his first encounters with mountaineering to the last years of his life. High Adventure is a rather humble retelling of the first successful summit of Mount Everest. From the reconnaissance mission of 1951, to the Himalayan training exercises of 1952 and finally the successful 1953 expedition, the book traces his long road to the summit. Hillary tells his story in a very straight-forward manner with a degree of nonchalance. The events of the story are often dramatic and the accomplishments great, yet he writes as though he is describing his morning routine rather than the climb of an 8000 meter peak. However, the intensity and difficulty of the 1953 Everest Expedition is not lost, and the book will leave you with respect for Hillary, Tenzing, the 1953 Everest team and high altitude climbers today. An informative, and at times, page-turning read, High Adventure lacks a personal element and tells the reader little about Hillary himself. In contrast, View from the Summit, reveals much more about Hilllary’s personal life and experiences in a thoughtful and honest way. Though his writing-style does not change much, he lets down his guard and reflects upon his life with a hint of nostalgia. While reading the book, I often felt as though I was sitting in a cozy den listening to Hillary recount his life’s joys, hardships and adventures. The book begins with a concise, colorful, and ultimately, more interesting retelling of the 1953 Everest Expedition. It is more opinionated too. To start, he admits that he was not John Hunt’s biggest fan and he describes his anger about discovering that Eric Shipton would not be leading the expedition. Perhaps the most interesting addition to the story of the Everest climb was the description of his realization that he, a simple bee-keeper from New Zealand, had become a celebrity overnight and his life would never be the same. It took him a few speaking tours to figure out how exactly to handle the publicity and he soon learned to embrace his status and to use it to help improve the lives of others. He started the Himalayan Trust in order to raise money for development projects throughout the Himalayas and the organization is still going strong today. Many people know about Hillary’s summit of Everest and his humanitarian efforts, but most now little else. View from the Summit tells the untold stories of Sir Edmund’s life. He led a team of tractors to the South Pole (a much more difficult endeavor than it sounds), led an expedition to search for the yeti in Nepal, and jet boated up the Ganges River making it all the way to the headwaters. After summiting Everest, Hillary did not have much luck with high altitude climbs – in fact, he suffered from cerebral edema several times and avoided death only by relying on the rescue efforts of his fellow climbers. Also, he lost his wife and youngest daughter in a plane crash and sunk into a dark period of guilt and sadness. He remarried in the late 80s and became the New Zealand High Commissioner to India in the 90s. Up until the last months of his life he was still visiting his friends in Nepal, building schools, hospitals, dams, and other infrastructure to improve the lives of the people there. Now that is a life well-lived! If you’re looking for an account of the first successful summit of Everest, then consider reading High Adventure, but if you’re more interested in learning about the life of a fascinating and inspiring man, then View from the Summit is the book for you.